Money is an integral element in the Grand Theft Auto series, with its importance varying game by game. It is a statistic primarily represented by a counter on the player's HUD as the amount of money in hand. Missions are often emphasized as a reliable source of income, but the player may resort to other means of obtaining money in the game. In early GTA games, money is emphasized as the key to unlocking new areas in the game, but it may also be used in various other activities. The formula was dramatically modified after Grand Theft Auto III, when money was only important for specific missions as the completion of missions unlocks new area instead; the former was removed entirely after Grand Theft Auto: San Andreas. Since GTA III, the primary use of money is to purchase of items and services, such as Health, Body Armor, clothing, and Weapons. Money is also needed for respraying and/or repairing vehicles at a spray shop. As the vast majority of settings in the series takes place in the United States of America, the currency unit of money is the dollar. The London add-on packs for GTA 1 (Grand Theft Auto: London 1969 and Grand Theft Auto: London 1961) are exceptions; as the games are set in the United Kingdom, the pound symbol substitutes the dollar symbol. For progression into new cities or areas and storyline in Grand Theft Auto 1 and Grand Theft Auto 2, money must be earned to the point a certain amount is fulfilled, often in millions. Money in the two games are relatively easy to obtain. Acts of crimes, murder and traffic violations often award players with scores, giving the player small quantities of cash. Missions, however, grant players larger amounts of money, in addition to score multipliers that increases the aforementioned monetary award from street crimes by one fold for each mission. This formula, assuming the player continues to successfully complete missions, will result in the player obtaining progressively larger amounts of money until a certain amount is reached and the player may progress to the next city or area. 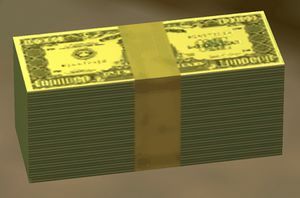 The use of money for other purposes was explored in GTA 2. With the ability to save games, the player must have a certain amount of money in hand to enter save points (comically represented by a "Jesus Saves" evangelical place of worship which demands donations in order for the player to "save" his "soul"). The game also offers several drive-in shops where the player may remove their wanted level, upgrade their vehicle with equipment, or install bombs, all at a cost. In Grand Theft Auto III, the money system was completely refashioned. While certain street crimes still award players with small amounts of money, the score multiplier is removed, and pedestrians, except emergency personnel, drop cash onto the street upon death. Missions still provide substantial amounts of money, but sub-missions, which debuted in GTA III, serve as an additional source of income, awarding the player with increasingly more money as the sub-missions progress. Money in GTA III is assigned a secondary role in game progression for specific missions only, when the player is required to pay 8-Ball large sums of money to construct a bomb in "Bomb Da Base Act II", and when the player must pay a large ransom to secure Maria Latore's freedom, who is kidnapped by Catalina and the Colombian Cartel, in "The Exchange". Outside missions, money remains important in the purchase of weapons, respraying of vehicles and the installation of car bombs. Sessions with prostitutes, another addition in the game, also incur a cost to the player, depending on how long the player requires her services. In Grand Theft Auto: Vice City, instant monetary awards for street crimes are largely eliminated (saved the destruction of helicopters and hijacking taxis, which was later removed in GTA San Andreas), leaving missions, sub-missions and dropped pedestrian cash, and robbing stores (in addition to the destruction of parking meters in Downtown) as the only visible sources of income. The average amount of money awarded to the player and cost of items were also divided by 10 (i.e. the use of Pay 'n' Spray costs $100 in GTA Vice City, compared to $1,000 in GTA III). The game also reduces the number of missions where large sums of money was needed; only one such mission remains, "Keep Your Friends Close". 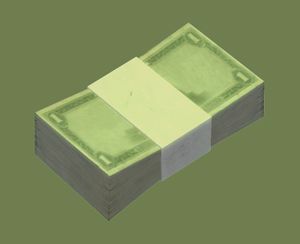 Maintaining the relevance of money in GTA, the player is offered the possibility of purchasing properties and businesses at varying costs. Upon completion of missions or sub-missions for one of said businesses, the business will begin amassing a certain amount of money each day, which the player may pick up at their own leisure. As a joke, the player can earn $50 "Good citizen" bonus by beating criminals chased by police (but without use of any firearms). Money in GTA San Andreas. While the money system is largely unchanged from the last installment, Grand Theft Auto: San Andreas expanded on the number of options to earn money and spend it, by introducing a variety of new sub-missions, establishments where players may purchase food or clothes, vehicle customization and gambling. Monetary pickups in gang turf are present, and, like GTA Vice City, properties may still be purchased and produce income of their own. In this game it is also possible to be in debt if the player had lost a great amount of money in casino gaming. If this happens the henchmen of the casino's owner will go after CJ to kill him a bit later. The player gets large sums of cash for missions like in GTA III, however there are no more needs for the money aside from weapons. The money system works just like the previous installments from the GTA III Era. Aside from a mission which requires the player to have enough money to pay for some explosives, the only other thing the player can spend it on is weapons, prostitutes, ferries, Pay 'n' Spray and bombs for cars. Money's importance increases by a bit and aside from the previous purposes. The player can again purchase properties and build the business assets from them into whatever type they please. Money can now be gained easily through the new addition of the empire building and instead of picking up the money from each property, the player gets it through a pager message at 16:00 (4 PM) each day. The core of the money system is unchanged in Grand Theft Auto IV. However, profitable sub-missions, which were sources of income since GTA III, are reduced to Brucie Kibbutz's Exotic Exports, The Fixer's Assassinations, and Stevie's Car Thefts. But after completing all 30 of Stevie's car theft missions, the player can bring any vehicle they want to his garage for extra cash, at varying prices depending on the model and condition. The game also allows the player to open cash registers for small amount of cash (robbing the business), and blowing up a Securicar armored truck (scattering money on the street for the player to pick up). Like weapons, money now lies realistically on the ground with a yellow-green glow to catch the player's eye instead of floating in mid-air. As in GTA San Andreas, the importance of money for the purchase of food and clothing is reintroduced. Outings with friends or girlfriends also require substantial amounts of money when going for a drink, eating or bowling. Players are also given the option of simply giving money away to street musicians (for health) and tramps. Money can be obtainable like in previous games (missions, fighting people,etc.) and win after purchasing a Scratch Card. In Grand Theft Auto V, each protagonist has his own bank account. Earning money in GTA V is more difficult than previous games as many of the story missions do not give the player any money. The maximum amount of money any protagonist can have in GTA V is $2,147,483,647, as the money counter uses a 32-bit integer to store the value. GTA San Andreas, when the player is in debt. This page was last modified on 31 March 2015, at 04:43.